Lately, I have had two people, aquaintances, really, not exactly friends, tell me they don't eat dairy. One of them said that she (and her group at Cross Fit) believe it's strange to eat dairy or drink milk because humans are the only mammals that drink other mammal's milk. I wanted to say, "That's because we're at the top of the food chain!" But I didn't say it. She's about half my age, so I don't argue with her about it. I just found out another friend thinks dairy is "evil." Her word; not mine. So, today's Thursday Thirteen is all about dairy. 1. There are no antibiotics in milk, regular or orgaic. 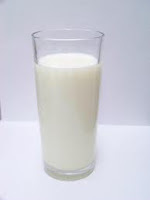 Milk is tested, and if it is positive for antibiotics, it is disposed of. 13. And the best reason to eat dairy? Milk tasts great with cookie or cake! That last one is the best reason. Although I confess I don't do dairy, either, but its because it bothers me (lactose and it seems to upset my asthma) not because of any other thought on the subject. I am probably paying for it now that I am older with bone problems. I'm a total cheese freak. Never was a huge milk fan. Although I'm not big on milk itself, I do love dairy! I agree with you 100%... God gave us the ability to raise livestock with the purpose of using them as a food source. Bring on the bacon and eggs, with a big glass of milk to go with it! Love number thirteen - and milk and ice cream go great with pie, too. We celebrate June Dairy Month big here in Wisconsin, from Cows on the Concourse the first weekend in Madison to farm breakfasts across the state. COTC not only gives people the chance to see dairy cows up close and personal, but allows them to partake in all sorts of dairy products: milk, cheese, ice cream, grilled cheese sandwiches, yogurt, etc. Madison is also host of the World Dairy Expo and Wisconsin Cheese Makers Association (which hosts the World Champion Cheese Contest). I'm a dairy junkie! Boo to friends who think its evil. I'm not a milk fan, though I do have to have it to dunk Oreos into. I love other dairy products, though! I want to be vegan! In a few years I plan to go completely vegan, and honestly, I see soymilk as much healthier and more beneficial. Around 75% cannot digest regular milk. Also, often when one drinks soymilk, he or she gets sick less often. I currently avoid as much dairy as possible. I've read numerous articles (at a friend's request) that claim dairy isn't good for you, but I don't buy into it. I know too many people who lived long, healthy lives, and dairy was definitely part of their diet.